Not far from where we live, along the banks of the Tyne, is a collection of recycling businesses. Discovering these prompts a look at where we’re at and what we could be doing. When I left Cornwall, ten years ago, we were required to separate plastic into ten different types. This proved too hard for ordinary mortals and so the council needed to man the collection lorry so that sorting occurred. I have no doubt this rapidly proved to be too expensive, explaining why the current thinking is to do the sorting at a central depot and then sending the sorted materials to specialist handlers. The problem as perceived by my local council is the reduction of landfill, coupled with the education of the populace into reduction of waste and recirculation of materials. Terminology, mostly starting with the letter R: We start from an assumption of a body (person or company) disposing of unwanted goods. Recovery is the movement of unwanted goods to someone who will keep it in circulation. Call reuse (or re-use¹) finding another party who wants the same goods for their own purposes. Repair is, obviously, referring to taking the unwanted good and restoring it to at least partial working order, possibly to a state of resale. Let us call recycling any process that renders the original into component parts and then uses these parts to make another product. Reprocessing is material made from the industrial process scrap, e.g. the UK plastics industry recovers around 300,000 tonnes annually this way [bpf site]. All other waste (called unrecyclable) goes into the same space as the refuse lorries deliver to. The council attempts to sort some of that material. • Glass, where the recycled material, called cullet, needs to be cleared of contaminants (the labelling, the closures). See Page 638 for a description of the glass recovery process. Every tonne of recycled glass saves its space in landfill, saves 225kg of CO₂, saves 1.2 tonnes of raw materials (not all, but a lot) and 345kWh of energy. Glass can be recycled forever but the expensive bit for now is removing contaminants and the waste that produces. Green glass in recycling exceeds its national demand and so is less efficiently moved to other uses, mostly in construction materials. That is not as good as what we can call closed loop recycling. • Paper, meaning printed paper including coloured and glossy papers, but we treat cardboard separately. Cardboard, “corrugated case material”, is processed differently from paper. Waste paper is better sorted by quality [50 grades in 11 groups, page 858]. For how, see wikipedia (and make a donation each year). One tonne of waste newspaper saves one tonne of wood; a tonne of printer paper saves two tonnes of wood. Recycling half the world’s paper might save as much as 80,000 km² of forest every year. That’s four Wales.² Internationally, about half of all recovered paper comes from converting losses (pre-consumer recycling), such as shavings and unsold periodicals; approximately one third comes from household or post-consumer waste. We now use more paper for packaging [over 40% of total output] than for printing. I think (i.e. I didn’t find a site confirming this) that recycling paper is not a closed loop and that in each cycle the grade of paper declines. This may be called down-cycling. The EU reached a target of 66% recycling of paper by 2010, where the US is more than 10% behind. • Metals, once we’ve identified what they are, specifically steel, aluminium and copper. Steel has reached 60% recycling worldwide. The US managed 83% in 2008. Down-cycling occurs and is expensive to counter. One tonne of steel saves 1.1 tonnes of iron ore and 0.63t of coal (wiki, ferrous metal recycling). Aluminium is in theory 100% recyclable, and requires 5% of the energy used in originating the metal from ore. For process see here. The US recovers about 30% [30% of production comes from scrap]. Brazil recovers something like 98% of its aluminium cans. I predict this process will be examined in GCSE Sciences. The EU recovers 67% of Al cans [2010, here] and Britain is not doing so well, at around 54%; it should be 75% in 2015. • Plastics, identified these days by a resin code (right), from 1-7. See the British Plastics Federation site, if only for a change from wikipedia. Codes 1 & 2 can give us closed loop cycles, where the UK reached 46% in 2009. Improvements in technology gave us processing of rigid plastics (19% of household plastic waste goes into recycling rigid plastics) that same year. About half of the 5 million tonnes of plastics used in a year in the UK are packaging. • Batteries, which have different processes depending upon the chemistry [lead acid, alkaline (Zn-C, Zn-air), lithium ion (Zn, Mn, Cr, Fe), nickel-cadmium (Zn, Mn, Cr, Fe again), Lithium (Li-C), mercury (Hg and others)]. Plastics, metals (casing, electrodes) and acids (electrolyte) need to be extracted in separate processes. Small, fiddly work but worthwhile due to the scarcity (and thence value) of the materials. ii) Three specialist disposal companies handling a wide range of electrical goods on the same estate, Morston Quays. [GAP waste management NE28 6UT, Matrix Recycling NE28 6UE and PA Moody, NE28 6BY]. Electrical equipment is disposed of in accordance with the WEEE directive (2007). Of course it is; and one says so to explain why you may pay for disposal. SITA UK is a big business which among other things turns waste into fuel and has a local transfer station NE29 7SH. Looking for others in the immediate vicinity, I found a metal recycling plant in NE6 and Wallsend Recycling Company NE28 7RZ seems to be a scrap metal specialist. Pilgrim Co UK NE28 7RH no website found. Davy Recycling management (and other names) NE28 6UZ - I found no site but a planning application for extensions to store aggregates and the like. Enviro-Cure does lighting recovery NE28 6EH. I found a branch of YesWaste in Wallsend, specialising in battery recovery. All this in my own postcode. I don’t think it proves this is big business, but it does show that the problem is being taken seriously. Prevention Using less material in design and manufacture. Keeping products for longer; re-use. Using less hazardous material. Preparing for re-use Checking, cleaning, repairing, refurbishing, repair, whole items or spare parts. Recycling Turning waste into a new substance or product. Includes composting if it meets quality protocols. 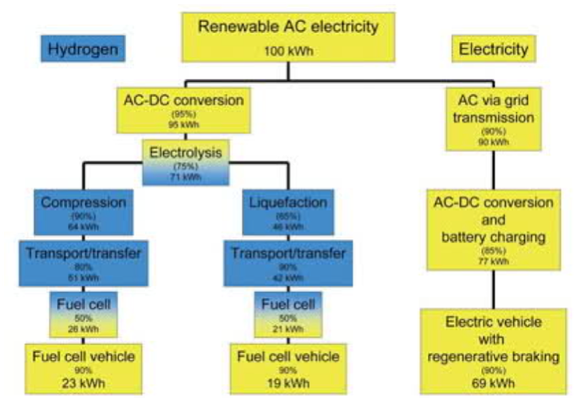 Other Recovery Including anaerobic digestion, incineration with energy recovery, gasification and pyrolysis which produce energy (fuels, heat and power) and materials from waste; some backfilling operations. 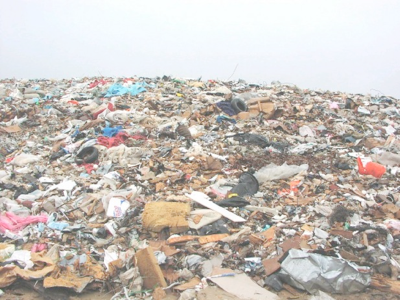 Disposal Landfill and incineration without energy recovery. So the question to ask ourselves is, “How should we change our behaviour?” For us as domestic residents, as opposed to people running businesses, we are affected by the top layers of the waste framework triangle. Prevention includes the needed huge reduction in litter / packaging, particularly for plastics and paper; it includes us changing our attitudes to recycling, being perhaps more intelligent and better informed about what we can recycle, how and where, including developing good domestic habits for collection – I can see we’ll need some more space at home to attend to this. We need to be aware what will degrade, how fast and therefore how we treat such material; we need to be aware which materials we can re-use and to do this intelligently – it is one thing to keep some plastic bottles to encourage insects into the garden, but entirely a different issue to re-use all the packaging that comes into the house. At a domestic level we need to encourage suppliers to take away the old appliance and the new packaging, in the hope that their larger scale operation means they do disposal well. 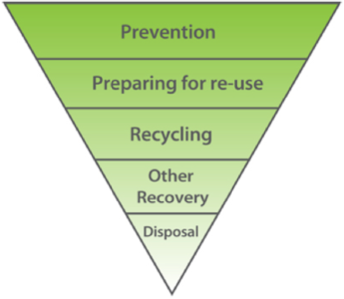 We need to develop better technology to re-use, recover and recycle all materials and indeed to develop processes that make such recovery better – that gets us well into the second layer of the triangle graphic, and at a domestic level means that we’re going to be doing a good deal more preparation before disposal – washing, removing labels, separating materials and so on; that in turn means that as a society we need some incentives to do this. The social engineering that implies is an associated problem. As yet there isn’t enough value in waste materials for people to go collect stuff locally to turn into the local processing plant, as happens in China, but there it is the huge range in earnings that makes this rewarding. Such a situation may yet arrive, even without the post-apocalyptic background required in the films we watch that show recovery as important. I’m reminded of some reports from Cuba where recovery and re-use is high. I’m bothered by the needs to incentivise the population; the need for education so as to have responsible behaviour, the need for some sort of rewards for ‘better’ behaviour and I worry that instead we will develop a load of penalties for non-compliance instead. I hear a call to dinner; no waste there. Want not in the sense that if we’re careful, we’ll not be short of materials. Wikipedia tells me that plastics 3, 4 and 7 are not often recycled. It tells me that the others can be ‘recycled through some curbside programs’. 1 re-use I don’t like reuse as a spelling, since it doesn’t read as a two separate vowels. I think re-use is better writing. 2 Small reference to the use of Wales as a unit area when we need a large one Wales is 20735km². Such units are usually rounded to the first significant figure. I refer elsewhere to the unit a kilo-wale, which has inherent amusement value.